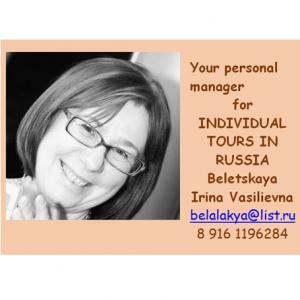 Having 20 years of experience in tourism, I want to offer you my services in booking hotels and creating individual tours in Russia of any complexity and for any number of people. 1. I book hotels All Around Russia, Byelorussia, Armenia, Georgia, Kazakhstan and other countries. I have an agreement with most of the best reservation systems. I optimize the cost for the same hotel from all suppliers of this hotel (compare the cost of rooms in the hotel itself and with reservation systems) and offer you the best price for the hotel you need. 2. I make tours of any complexity to most of tourist destinations in Russia: Moscow, Golden Ring, St. Petersburg, Baikal, Altai, Kamchatka, Vladivostok, Murmansk region, cruises along the rivers Volga, Lena and other destinations. 3. Organization of transfers in any city of Russia from an individual car (meeting at the airport) to buses for any number of people. At your request we can order cars of class Comfort, Luxury or Executive class. 4. Organization of sightseeing tours in all cities of Russia. 6. Insurance for all days of travel (optional). 7. I offer guide-interpreters for any number of hours. 8. I compile an estimation of services for the selection of the optimal project cost. Why is it advantageous to book travel services through me? 1. I have a lot of experience in corporate services for state companies and I know all the main suppliers of tourist services in all Russian cities. 2. I am able to optimize the cost for the service you need and will offer you the most optimal value, which will lead to savings of money. 3. I work only with reliable and trusted suppliers of tourist services, with whom I have repeatedly worked out complex state orders and who are fully responsible for my work.